Welp. I think this is the last soup I’ll be sharing for a bit. Which makes me both excited and a little bit sad. Excited because HELLO SPRING and warmer, longer days. But sad because, well soup is definitely a favorite that will be missed for the next several months. But to be honest, we’ll still probably be eating it year round, just far less frequently on warm (probably never on HOT) days. I mean, we did grill chicken on one of the coldest days this past winter, so that tells you we probably aren’t the most normal. ? And I might add, that was some of the yummiest grilled chicken ever. Marinade recipe will definitely be appearing sometime in the next coming months! 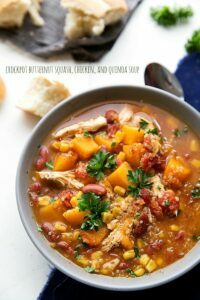 This soup is heavily adapted from my creamy crockpot enchilada chili. That was such a huge hit with my family and with so many readers (?? Hi!! thanks for your comments and sharing your photos! They make my day!) that I had the idea to make a green chile chicken enchilada version. 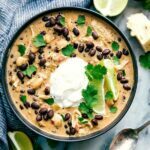 Green chile chicken enchiladas are one of my family’s favorite meals, so why not make it into soup form?! And this soup has been equally loved. 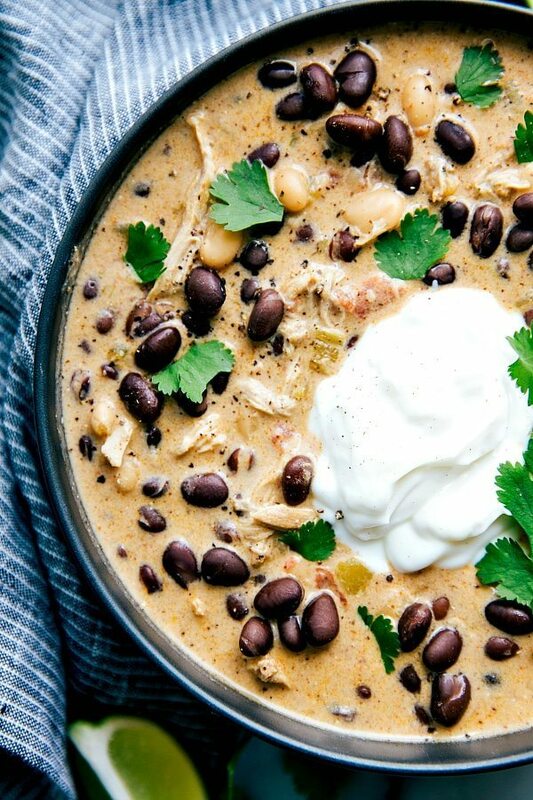 If you like green chile enchiladas then you are in for a mega treat with this soup. And just a heads up, I keep calling it a “soup” because it sounded a little redundant to title it “green chicken chile enchilada chili.” However, this is more of a chili type of soup and ends up being pretty thick after the cream cheese is added in. And finally, just like the other enchilada chili, the toppings are key for the best ever soup. Our favorite cheese with this soup is pepper-jack — it is delicious! 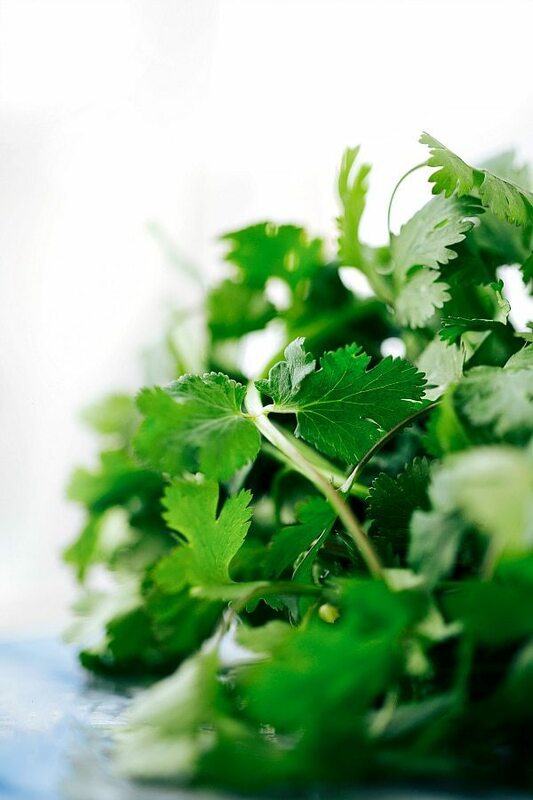 And other MUST haves: a fresh squeeze of lime, sour cream (we use low fat and love it just as much), and some fresh cilantro. 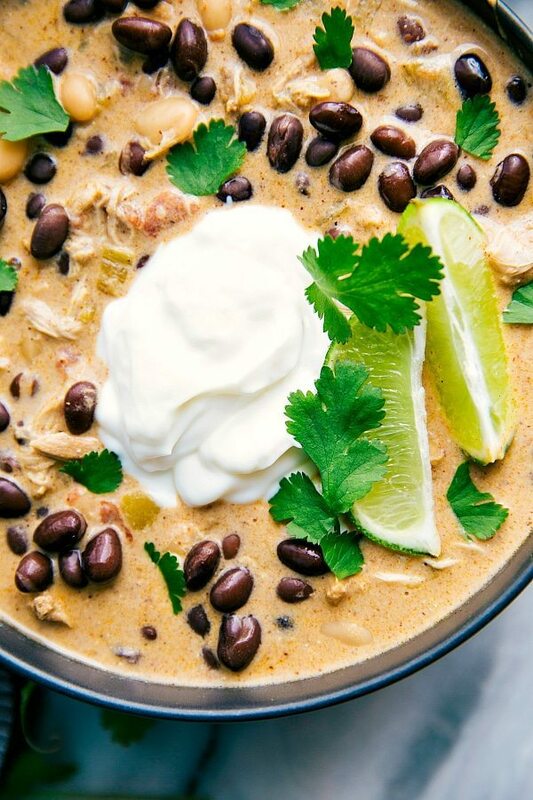 In a large crockpot (I use a 6-quart crockpot) pour in the green enchilada sauce, drained and rinsed white beans, drained and rinsed black beans, and fat-trimmed boneless skinless chicken thighs or breasts. Add the undrained diced fire-roasted green chiles, diced tomatoes (if desired, it's great with or without them), chili powder, cumin, paprika, about 1 teaspoon salt (I prefer seasoned salt), about 1/4 teaspoon pepper, coarsely chopped fresh cilantro, and chicken broth or stock. Cover and cook on low for 5-7 hours or high for 3-5 hours or until the chicken easily shreds. Remove the chicken from the crockpot and place in another bowl. Add softened cream cheese (cube into smaller pieces and melt in the microwave) into the crockpot. Cover and cook on high for another 30 minutes or until the cream cheese melts completely and is easily stirred into the soup. Briskly whisk to get the cheese completely incorporated. Shred the chicken with 2 forks and then add back into the soup. Serve with desired toppings. I love a big handful of pepper-jack cheese, fat-free sour cream, a wedge of lime, and some cilantro! You just reminded me that I need cilantro. 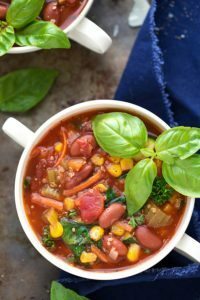 This is such a great looking soup, even though I don’t eat meat, I would definitely try this sans meat because everything looks so tasty! I cooked this last night (without tomatoes -wished i had added for color but kids don’t like them) and just finished eating a bowl for lunch. It is delicious. Just FYI, the printed recipe is missing step to add chicken broth. Great recipe and easy to follow directions. Oh my goodness! I made this tonight since I’m always looking for something easy and tasty. It was SO good. I could have eaten 3 or 4 bowls, but I’m also 8 months pregnant so I can’t fit that much food in me at once! But I’m so looking forward to my leftovers tomorrow. Thank you for the great recipe! Haha I know what that is like to be 8 months pregnant and you want more but can’t have it 🙂 Haha! I’m so, so happy it was so enjoyed! Congrats on your pregnancy and good luck here at the end! Wow this looks so cheesy and delicious! Pinned it for later. Thanks! You bet! 🙂 Hope you love it! This is an odd question I guess. But just wanted to clarify, you add the chicken with everything else, raw right? How integral is the cream cheese? Just doesn’t sound right to me ; ) Would heavy cream be a okay substitution? It’s quite integral to the recipe! I know it sounds weird, but it’s so delicious! I haven’t tried heavy cream so I can’t say for sure how it would turn out, but if you do try that instead I’d love to hear how it works! I live overseas and do not have access to cream cheese. I made the soup as the recipe said, but then warmed some heavy cream on the stove and added it in slowly to the soup at the end. I also added some shredded cheese and nutritional yeast to up the cheesy-flavor. I think it turned out just fine! If you use them, do you drain the tomatoes? They will work drained or undrained 🙂 I did not drain. This soup turned out amazing!!! Just made it. Thanks so much for recipe. This looks amazing. I’m just starting to make it and I’m wondering how well do you think it would freeze? I’m not sure since I never have frozen it, but I don’t think it would do too well with the cream cheese… Wish I could be of more help! Hopefully someone else can chime in here that has tried freezing it. I cooked this in the slow cooker but after 3 hours on low the chicken was already at 165 – are the additional hours needed if the chicken is cooked trough? Nope 🙂 You must have a speedy slow cooker! It should be all good as soon as that chicken is done! Oh my gosh this is the best Mexican soup I’ve ever made or tasted! I described it to my friend as “award winning”! 🙂 thank you SO much for this awesome recipe. I omitted one can of black beans and added a teaspoon of garlic powder and a cup of cooked brown rice. Delicious!! Yay!! Totally made my day with this comment, thank you so much! I’m so happy it was so well enjoyed 🙂 And the rice sounds like an amazing addition!! When you say “chilli powder” do you mean powdered ground chilis, or do you mean the spice mixture that has cumin and all the other seasonings in it? I have both, and I’m not sure which you mean, so unsure which to use. Thanks for the question! I mean the spice mixture 🙂 Hope you enjoy! Do you put your chicken in whole? I will be using chicken breasts. Or should I cut them up? If you are using chicken breasts, I’d cut them in half if they are super big. I am having trouble finding green enchilada sauce in my grocery stores to make this. Is there something I can sub in? Could I use red enchilada sauce instead? where have you been able to find the green stuff? Thanks! Awesome! 🙂 I hope you love it! Added tomatoes with green chiles for an extra kick. It was spicy delicious and soooo easy! My computer wouldn’t let me 5 star it, but it definitely is. I used reduced fat cream cheese, and it wouldn’t melt. I ended up fishing it out and using sour cream instead. Next time I’ll use regular cream cheese! It was still great with the sour cream; the whole family liked it! Can I use left over cooked shredded chicken? Have you worked out the nutritional information? If so, can you post? I’m following Weight Watchers and would like to calculate the point value. Thanks so much! Hi Susan! I just added a nutrition label to this recipe for you 🙂 I put it right at the end of the post. Enjoy! I made this for dinner last night and it was so delicious and so easy. I have a 2.5 month old so easy is key! I only added one can of black beans and no white beans as I’m not a bean fan. I also used 1/3 less fat cream cheese. Other than that followed the recipe exactly and even added the tomatoes. Thank you thank you thank you! Wow! This was a serious home run. I am a soup fanatic, it’s what I do, and I rarely follow a single recipe. I find a few and mash them, or one and make a lot of changes. Soup is forgiving (unlike baking). I made this exactly as written, not a single change, and it was crazy good! Although the temps here are still high the wicked allergy season left me craving comfort and warm soup. Thanks for an absolutely perfect recipe. This is in our regular rotation now! I’m attempting this recipe as stovetop version of this as I type this. I only rinsed the white beans and didn’t drain all the others as I figured I would need more available liquid, also I’m using a Copper Chef 6qt pan. So far all is well! Thanks for the recipe! OH EMM GEE! This was fabulous! 4 people = no soup left! The stove top method works excellently and only about an hour total. Thanks again this is definitely moving into the rotation! This soup is awesome!!! My husband and I loved it! 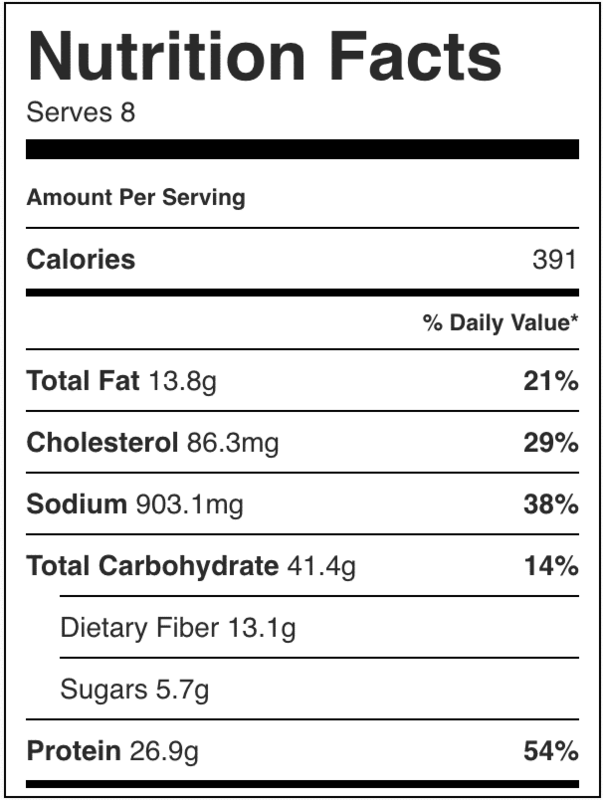 just out of curiosity, how much is a serving size? If you evenly divide the soup into 8 equal parts, each individual part would be one serving size. Hope that helps! We loved this!! I did change a few things…I wanted more of a soup than chili so I doubled the enchilada sauce and added one more cup of stock…also I love hominy so I added that as well, made it with 1.5 LB of chicken thighs….garnished with pepper jack cheese, cilantro, and lime as suggested. Also added some crushed tortilla chips… AMAZING!! I want to eat more, but I am so full!! This is definitely on my list of go-to’s! A big hit with the whole family!!! Hi Stacie! Thanks so much for your comment and for sharing what you changed 🙂 I’m so thrilled this was a big hit and am so glad you took the time to tell me! Made this today and it was a HUGE hit with my family. Even my picky eater had several bites. Going to work this into the rotation for sure! I am SO thrilled to hear this was a huge hit! Thanks so much for the comment and review Margaret! This sounds amazing! But my favorite part of enchiladas are the corn tortillas, so I think I would have to incorporate them in somehow. They’re not enchiladas without them. Would this work with ground chicken? I always get nervous to make things in the crockpot since I can’t adjust seasonings as I go, but decided to give this a try since it has great reviews. Wow! I am so glad I did. My whole family (husband, 4 yr old, 3 yr old, and 18 month old) all loved it. We ate it all in two days! Thank you for the recipe. It was delicious. In fact, I’ve already passed the recipe on! That is so wonderful to hear!! I’m thrilled everyone in your family loved it 🙂 Thanks so much Jennifer! I’m a young (23) American girl working in Italy, from Arkansas, so I MISS Mexican food and Tex-Mex so much. I tried this recipe so I could have a big batch for lunches in the office all week and it was so great! Reminds me so much of home. My boyfriend is Italian and struggles to embrace Mexican cuisine (Italian stomachs aren’t used to the spices and such, they think the food is too heavy), but he LOVED this recipe and ate two bowls for lunch! My mom just shipped over a bunch of green chillies and spices for me, so this was a perfect way to use them. Thanks so much for the great recipe! Awe this made my day! 🙂 I’m so thrilled you were able to enjoy this soup in Italy and that your boyfriend enjoyed it too 🙂 Thanks Lindsey! This one looks like a winner! Just two quick questions…how spicy/hot is this? My husband loves soup so can’t wait to make it but he doesn’t like his book really spicy/ Should I cut back on the chili powder? Also, do you drain/rinse the white and black beans? Thanks! Thank you BB! I would say it’s pretty mild, but I can handle a lot of spice. So maybe add half the chili powder and then you can add more after a taste test before serving it 🙂 And yes, drain and rinse! Enjoy! Made this wonderful green chile enchilada soup today. Amazing and satisfying flavors! I will definitely be making more of this soup! Thanks for sharing with others! This was so good! I added jalapeños for extra kick and even tried it over off left over rice! It was great. 100% going in the rotation for winter. Perfect receipe for college kids who never have time to cook! I’m thrilled this was a hit! 🙂 Thanks for the comment Alexandra!! Do you need to add the cream cheese? I am looking for nondairy recipe. I didn’t use the cream cheese for a healthier version, and I added fire roasted tomatoes and it was extremely delicious. For people who want it to be creamier, you can always add a dollop of sour cream or Greek yogurt. Do you think I could ah substitute coconut milk for the cream cheese? I also cannot have dairy but would love to try this recipe! I actually don’t think that would taste good at all. I’ve had a few people write in that they’ve left out the cream cheese entirely and still loved the soup; maybe you could try that? This recipe is SO good. 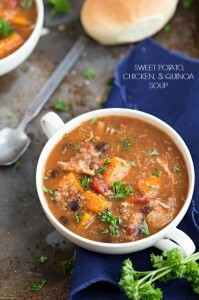 It is now one of our go-to soups because it is so easy and so delicious. I add the tomatoes like you suggest (yum) and I also add a can of sweet corn because my family likes corn. Perfect for these cold winter days and being a busy mom. Thank you for sharing!! I’m so happy to hear this has become a go to! 🙂 Thanks so much for the comment Robyn! My son and daughter who are 11 and 12 are picky eaters. The looks I got when they see soup is what’s for dinner did not go over well. In this case, it went very well! They wanted a second bowl and even talked about it on the way home from school the next day. Very delicious recipe. This will be in rotation more than the normal. Haha! 🙂 I’m SO happy this one went over well 🙂 Thrilled it was a hit! Thanks for the comment Nellie. It’s one of the first cold and rainy days where I live. I put this in my crockpot and shared your link on my blogs Facebook. Can’t wait to eat this tonight. I hope you love it Karis! 🙂 Thanks for the comment! 30 minute version! Made 12/12/16 Used leftover cooked chicken, 1 can of black beans, 1 cup chicken broth, red enchilada sauce, no extra salt, no canned tomatoes. I added enchilada sauce & softened cream cheese to a sauce pan heated over med heat then added chicken until cream cheese was combined well. Added rest of ingredients and mixed until heated through. Add more seasoning to taste. Toppings we used were sour cream, fresh lime wedges for squeezing over the soup, monterey jack cheese, & tortilla strips. AWESOME! DELICIOUS! 2 thumbs up from all 4 girls in my house (7-15 years old). Enjoy flavor my husband didn’t even reach for the hot sauce! Thanks!! I have this in the Instant Pot now, and I doubled it for some sweet friends who just had a baby. It just barely fit in the 6qt pot with a doubled recipe (I left out the tomatoes). Thank you for sharing this recipe! You’re welcome! I hope you and your friends love it 🙂 Congrats to your friends! Love this recipe big hit with my husband! Can you use pork stew pork instead of chicken and if so how? I have this in the crockpot right now. I added 2 jalapeños one with the seeds and one without. I also added a can of rotel and a bag of frozen Fiesta corn. Can’t wait to try it. 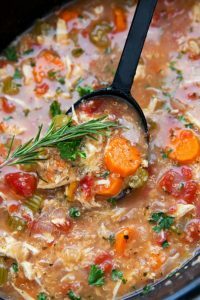 Was the chicken added to the crockpot frozen or thawed? Thanks! Can you make this with frozen chicken thighs? If so, what would I need to change in the recipie ? I made this recipe last night. I didn’t plan ahead, so I was unable to use the crockpot. I used a cast iron dutch oven at 350 for 1.5 hours. Turned out perfect. Another 15 minutes or so to melt the cream cheese. Only thing I was confused about is that in both steps 4 and 5, you have the chicken removed and placed in a separate bowl. I think I may be misunderstanding the directions. I took out the chicken in step 4, added the cheese, and put it back in the oven without the chicken. I added the now shredded chicken back after the cheese was melted and whisked to incorporate. I understand ‘why’ it’s removed, just not when, since you have it in two different steps. THIS SOUP WAS PERFECT. I added in 3 jalapenos because I love things extra spicy and had with Santa Fe style tortilla strips on top. SO GOOD. seriously one of the best crock pot meals iv tried yet. Thank you! I screwed up and thought I had black beans before I went to the store for the rest of the ingredients…. Turns out I had kidney beans, oops. I had 2 cans of white beans and 1 can of pinto beans so I said screw it, and just made it like that. Turned out pretty good! I substituted sour cream for greek yogurt (fage 0%) and added pepper jack, cilantro, and my guilty pleasure… crunched up fritos 😉 Turned out pretty good! Also added a can of corn, too!! 🙂 The fritos though… life changer!!! So happy you liked this soup and the crunched up fritos sound AMAZING! 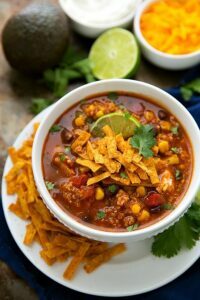 This soup is excellent with Fritos or tortilla chips (my favorite)! Love this soup. Loved this recipe so much! I wasn’t alone either…my three little ones went crazy over it. I added a little extra cayenne to give it just a little more kick. 🙂 Thanks for a great recipe, I’ll definitely be making this again soon! I’m so happy this was a big hit and especially with the little ones 🙂 Thanks for the comment! 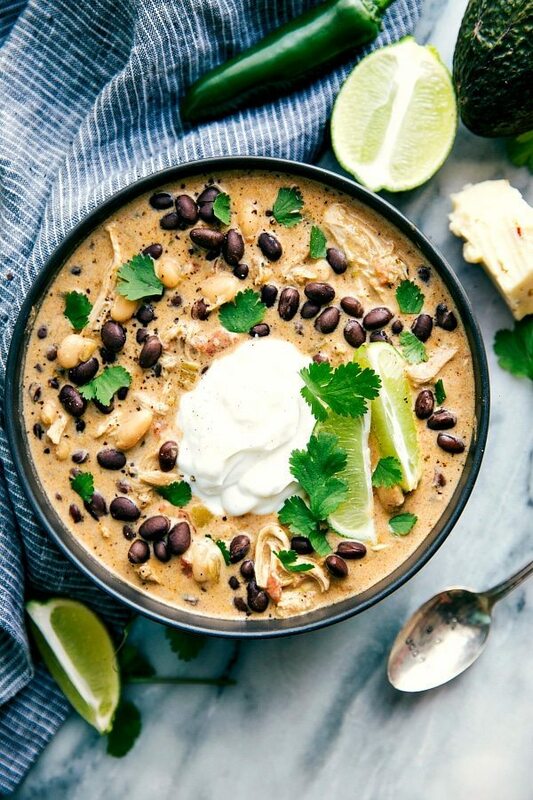 This is my favorite crockpot chicken enchilada soup! My recipe is a little different but not much. I use only black beans, 3 cups of chicken broth, & I use a good medium enchilada sauce. I also use garlic powder & serve with tortilla chips. Sometimes I add a can of tomato sauce. Yum! Wow this really delicious and mouth watering surely gonna try this soup and let u know my thoughts about it.Thanks for sharing such a unique soup recipe. Ugh, cannot find green enchilada sauce anywhere! Is salsa verde close enough? Now that the weather is cooler I decided to try this soup. Just got a new 6-quart crock-pot from Costco. Very easy to fix! I loved that. And, oh my goodness, is it delicious!!! My husband loved it too. I am not a fan of really spicy food so was a little worried but the melted cream cheese really mellows the soup. Adding sour cream, some chopped cilantro and lime juice as garnishes just makes it more divine! Awesome. I had some fantastic similar soup in New Mexico a year ago. I guess I would need to compare side to side BUT this one is as good or a super close second. I used the spreadable cream cheese and it still worked well. Think I will try freezing a little bit to see how it does. Agree probably wont do well but I am alone and even doing half it will last…well maybe only the day at the rate I am eating it. Looking forward to trying your other recipes. Love crockpots. No need to publish any of my comments. Since you made the change to the recipe card no one will know what I was talking about. On another note, you might be interested in adapting this recipe as your own for a quick and easy, no no-boil substitute for mac and cheese. I love making it in the Crock-Pot, and I have cooked it on top of the stove, in the and even the microwave. It has become one of my signature dishes to take to events. Mix the hominy and green chilies in the pot or pan you’re going to use to cook them. add the tomatoes if you decide to use them. Cut the Velveeta and chunks. Melted in the microwave. Mix in the sour cream. Stir to combine. Add the Southwestern seasoning, if using. Gently stir the cheese mixture into the hominy and then cook in the Crock-Pot, on the stove, in the oven, or in the microwave until heated through. I made this for dinner tonight and it was amazing! Even my picky toddler loved it! Thank you!! I have made this twice with pork. The first time I followed the recipe but cooked for 2 hours and added left over pulled pork at the end. The second time I had BBQ pork – ridiculous! this is how I’ll make it every time. So happy to hear you’ve been enjoying the soup! 🙂 Pork sounds delicious!! Thanks for the comment! Oh my, this was so delicious! I can’t wait to make this again. Thanks so much for this recipe. I have been making this recipe for over a year now and it is one of my favorites! Super easy and delicious… And I’m pretty sure it’s keto/low carb friendly – which is even better! 10/10. SO happy to hear that! 🙂 Thanks! I made this soup yesterday just as its written here and it was fabulous! This was so delicious! I made it in my Instant Pot last night. For those who would like to use their IP, here is what I did: Turn IP on Saute and when it says “hot” add 1 tbsp. olive oil. Brown the chicken for a couple minutes on each side. Remove chicken and add chicken broth and deglaze the pot. Add remaining ingredients and stir. Cook on Manual setting for 25 minutes and then 10 minutes NPR. Remove chicken and shred with 2 forks. Add cream cheese and whisk it in well. Add chicken back in and serve. I am SO glad you posted these IP instructions! It’s a cold snowy day in Wyoming and I was really craving this. Went and picked up all the ingredients and returned home to find I had left my crockpot at my brothers house. I was in a panic to figure out cooking time in the IP lol so glad I read through these comments! Thank you! Thank you for this beautiful and healthy recipe! My health condition makes me focus on some nutrition guidelines and this recipe is the best. Blessings, Samanaz. Awesome recipe! Tried it last night with a few adjustments for dietary needs and it was a hit! I made this last night. My husband and I LOVED it! Yay!! I’m so happy to hear! Thanks Megan! This was my first time making soup. This recipe is delicious and easy to follow. My family loved it! ? Thank you for sharing! ? Thanks for a fabulous recipe! We’re in the midst of a kitchen remodel and I needed a good crockpot recipe for this first cold weekend. The only changes I made were to use about half the amount of cream cheese and divided the paprika so that half of it was smoked paprika. We loved the soup and I’ll make this again and again! Thanks! Made this tonight. Yum! So good. I substituted one can of black beans with pinto beans. Added a teaspoon of garlic powder. Got that idea from another reviewer. Used the hot diced green chillies. Used a can of hot rotel tomatoes. Thank you for sharing the recipe. ? Delicious. I make this for dinner all the time ever since I’ve discovered the recipe! I add Frozen corn and extra green enchilada sauce ? Love love love this recipe!!! I didn’t read all the comments (because there are so many!!) and my question may be redundant. So I apologize if it is. I know there are 8 servings but how much is a serving? 1 cup? 1 1/2 cup? Hey Jennifer! So glad you’re loving this recipe 🙂 To get one serving, you’ll equally divide the entire soup into 8 equal parts; each part is one serving. Thanks for your comment!